In 1953, Marlin Brando stared in a film, "Wild One," about a motorcycle gang. The motorcycle Mr Brando rode in the film was a British made Triumph. Later in 1959, the famous Triumph Bonneville was born, named after the famous Bonneville Salt Flats in Utah. Today, the Triumph Bonneville has been resurrected as a modern motorcycle. 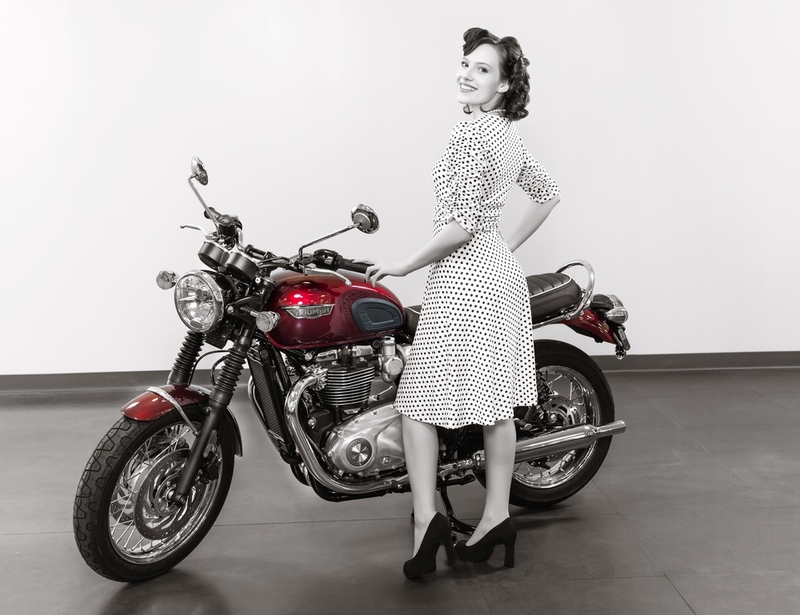 The '50s era Bonneville was the theme for this vintage styled photo shoot. 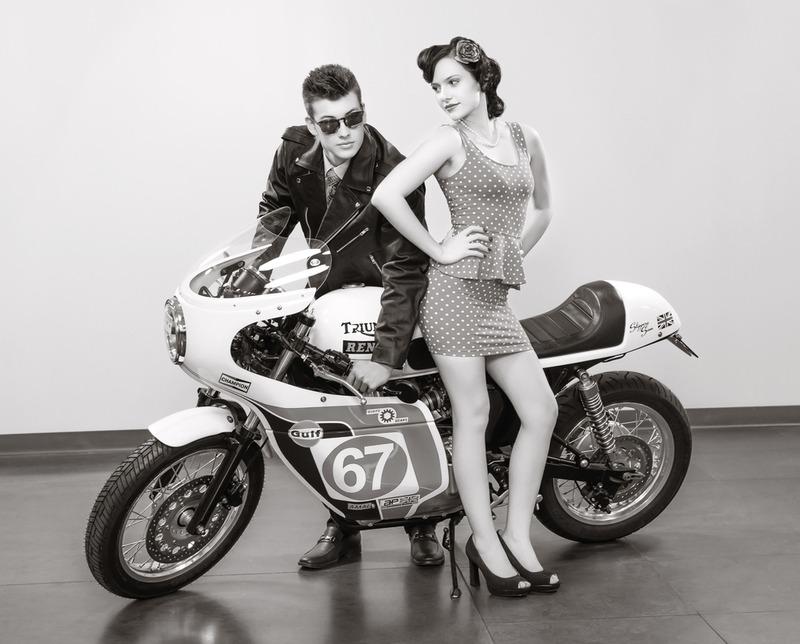 Our models, Madyson Wilmot and Bradley Perkins. The first task, aside from scheduling the location, hair, makeup and wardrobe, was to set up the lighting. My friend Tylor Carlson covers special events for RideNow PowerSports in Chandler, AZ and was happy to help coordinate the photo shoot and provide the location. For Hair and Makeup, Kat Divine. Lighting, Photography and Wardrobe, David Lloyd. My Lighting Assistant, Elise Pitterle. Note: for a closer look at the photos, click on them for a larger view. For portable lighting, I enjoy working with speed lights. Of the many light modifiers out there for Off-Camera Flash, I am very fond of the Profoto OCF light modifiers, due to their inherent light weight, light shaping quality and ease of in-feild assembly. While I have used a large number of light modifiers designed for speed lights, the Profoto OCF light shaping tools are my first choice. To that end, I have adapted my speed lights to work with them for exceptional light shaping. More info on adapting the Profoto OCF line of modifiers to speed lights in an upcoming article. While Elise and I were setting up the lighting; my daughter Kat was styling Madyson's hair and makeup, Madyson's mom was off to Wallmart to get a light blue dress shirt and gray tie for my grandson, Bradley - our male model for the '50s styled photo shoot. To keep the pace going and add some variety, we photographed four different models of 2017 Triumph motorcycles. A cute side note, Madyson and Bradley are 16 and still in high school. We thought it would add a degree of sophistication and a '50s look to include a cigarette. While the above pose is very demur, it took some fun coaching from Madyson's mom to hold the cigarette properly. The two photos above show the difference between full color and the black and white look of the '50s era. From the famous movie of the '40s, "To have and Have Not" the above photo reminds me of Lauren Bacall's famous line to Humphrey Bogart, “You know how to whistle, don’t you Steve?" ... in this case, You know how to whistle, don't you Bradley?